Northwood won the consolation game Saturday defeating Panama 5-4 at the Junior League World Series at Taylor, Mich.
Northwood, the Southeast Region champion, began the series winning its first two game and then lost twice in the same day to move into the consolation game. Northwood lost twice in the Junior College World Series Thursday. Northwood, from Taylors, is the Southeast Region champion. Texas beat Northwood 5-2 in the night game featuring once-beaten teams. Earlier in the day Northwood lost to Hawaii 12-7 in extra innings in a battle of unbeatens. Braden Johnson pitched Northwood to a 4-0 victory over Corpus Christi, Texas in the Junior Baseball World Series Tuesday night. It was Northwood’s (Taylors), second straight victory and next plays Hawaii Wednesday at 8 p.m. The opening ceremonies for the Junior League World Series were held Saturday, minus fireworks, at Taylor, Mich. Weather forced a smaller opening ceremony but officials said the fireworks display may be rescheduled this week. The Northwood Junior baseball team is en route to Detroit to play in the Little League World Series beginning Sunday. Northwood Little League’s 8-10-year-old team eliminated Florida in the Tournament of State Champions being played in Greenville, N.C., 2-1 in nine innings Tuesday. Northwood, the South Carolina state champions, plays Virginia, a 24-10 winner over Georgia. Defending South Carolina state champion Northwood Little League, from Taylors, was eliminated from the state tournament Monday night at the Chester Baseball Complex. The Northwood Little League begins play in the state championship tournament beginning Saturday in Chester. Northwood plays Irmo in its first game Saturday at 10 a.m. at the Chester Baseball Complex. The tournament is double elimination. 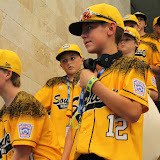 The Northwood Little League, from Taylors, will be honored at Sunday’s Greenville Drive game at Fluor Field. Northwood will run out with the Drive players for pregame introductions and stand with them during the National Anthem. Head Coach Kevin Tumblin will throw out a first pitch. A bloop infield single in the top of the fifth inning scored the run that ended Northwood’s dream at the Little League World Series Monday at Williamsport, Pa.
Maddox Burr of Kentucky dropped a two-out floater of a pop fly just over the pitcher’s head and too soft for shortstop Alex Edmondson to make the final out of the inning. Kentucky held on to eliminate the Southeast Regional champs, 4-3. • Meet the players here. Northwood staged a miraculous comeback Sunday in the Little League World Series but fell in the bottom of the sixth inning to home-crowd favorite, Pennsylvania, 8-7 in a winner’s bracket game.